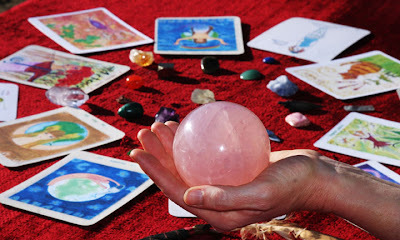 As a soul reader and spiritual guide, I am always being asked what it is that I do exactly! My friend Donnaleigh asked me this morning, "What is a soul reading? People are using that phrase now, and in my mind I picture it as an energy reading and a whole life synopsis rather than a psychic reading that pertains to specific questions. What is your sense?" So I came up with a detailed response to her question and thought I would post it here to give folks a better idea of what I mean by a soul reading. A reading of the energy field around your body through clairvoyance (clear seeing), clairaudience (clear hearing), clairalience (clear smelling), or clairsentience (clear feeling/touching). A look at your soul's mission and potential as expressed through your personality in this lifetime and in past lifetimes. An exploration of your physical, etheric, and astral planes to detect disease, blockages of life force energy, and unresolved emotional issues. Visualizations, affirmations, and gemstone healing exercises may be suggested. I am a medium and often receive channeled guidance, visions and messages from ancestors (departed loved ones), spirit guides and animal totems on the astral planes. 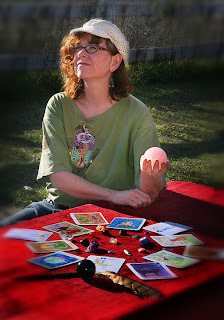 I connect with these guides using clairvoyance, clairaudience, clairalience or clairsentience. Foretelling the future through inspired inner visions. My artwork is intended as a sacred touchstone enhancing the message of your reading and will help you resonate on a visual level. I work with 4 oracle decks of my own creation: the fairy herbal healing cards, the lefty oracles, zodiac goddesses, and Celtic tree wisdom cards. Accompanying your reading, and in combination with the oracle cards I pull for you will be a wealth of information regarding specific gods and goddesses, zodiac based archetypes, herbal wisdom, and Celtic Druidic tree knowledge. (My art history degree does come in handy sometimes! An astrological chart is like a blueprint of your soul. It is a way to tap into your inner psyche so that you can understand yourself and others better. Tuning into the cosmos and cosmic patterns can help you shed light upon your everyday life and prepare you for major once-in-a-lifetime transitions. A reading is like a wake-up call for your soul. Discover your soul's true purpose and unleash your creativity. Move forward beyond crisis, clear blockages, reduce stress and promote peace of mind. Connect with your ancestors and spirit guides, feel guided and loved. Kathy Tyson, Technology Coordinator/Business Entrepreneur, North Carolina, USA: "This reading has given me the opportunity to go A HA! Every bit of it resonated within me. I love your visualizations and affirmations. Again, I am grateful for your gift from God. You are truly blessed." I meditate and do energy work and yoga for up to an hour before and after each reading in order to prepare for a session. I also spend about the same amount of time writing, composing and fine tuning the final illustrated transcript (and don't forget the follow-up email support that goes along with each reading!) So consider when you’re booking a reading, that it's approximately a 2 hour minimum commitment of my time. You will also benefit from my background in fine arts and poetry, along with the fact that I type really fast! I have given thousands of soul readings online since August of 2008. My specialty is helping clients get back on track by providing healing guidance and empowering tools along with messages from guides and ancestors. I feel honored and inspired to work deeply with people on a soul level and I am always thrilled to hear about the effect a reading has had upon a client's life. This work is extremely rewarding and I feel blessed to be given this opportunity. I continue to grow and learn from amazing healers, energy workers and intuitive guides so that I can offer you more in depth guidance and healing all the time. Note: I want you to be 100% satisfied with your reading and I'm always available afterward to discuss your reading in further detail. Here is a sample of an actual soul reading. You can purchase a reading here. You can read what clients are saying about their readings here.